A REAL SHOW PIECE! THIS BEAUTIFUL 3 BDR, 2 BATH, HOME SHOWS LIKE A MODEL! 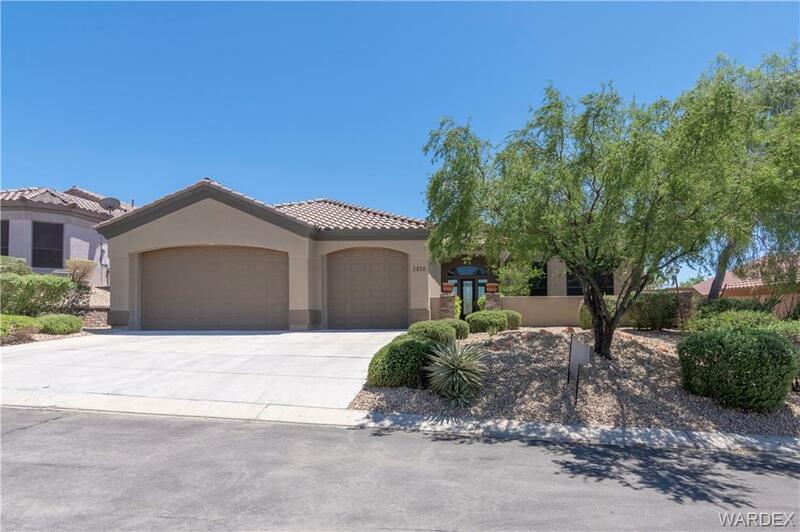 Located in the Premier Golf Community of LAUGHLIN RANCH. Enter by way of private court yard through beautiful designed obscure front glass door into this spacious floor plan. FEATURING a great room with 12' high flat ceiling w/views through large 8' high sliding glass doors to patio, fire pit and golf course! Then to the Kitchen and Dinning area w/10' high ceilings upgraded cabinets, granite counters, gas range and exceptional food pantry, all with views to back yard and golf course. All perfect for entertaining!! Master Bdr features dual sinks, walk-in shower, garden tub and walk in closet, 8' high sliding glass doors with access to Spa and back yard. The GARAGE! 3 car boat deep w/abundant room for cars or all the items needed to enjoy the mountains, lake, river or just storage of stuff. So enjoy the pictures and schedule your personal tour of this spotless beauty!! See You Soon!! Note!! Guest Bedroom has free standing closet.